Recently, a tea friend of mine often gives me shiso leaves, or Japanese perilla (a kind of Japanese herb), he grows at home. The herbs are always big and have a very shiso-ish aroma, which is great. Since he brings relatively a lot for one time, I always wondered why they grow so quickly, and asked him. 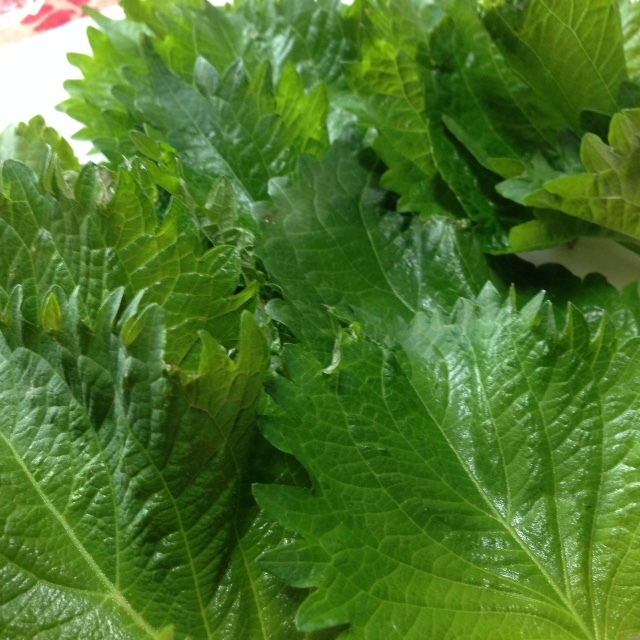 He said that his shiso in A pot especially grow very quickly. Sounds curious.... What’s the secret!? Over our chatting, he found out one possible key. During last winter, he often put used tea leaves, usually black, to soil in the pot after drinking morning tea. In other word, he composted used tea leaves. He said that that’s the only difference from other pots. There is no scientific grounds, but it is highly likely that the used tea leaves help shiso grow that well. I was surprised to hear that, but good to know even the plants like tea! :-) . I haven’t done that before, but why not? I always have a pile of used tea leaves. I will compost used tea leaves this winter to see how my plants will grow next spring.